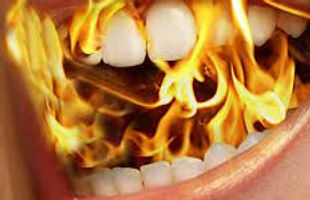 Burning Mouth Syndrome (BMS): “Chronic burning pain in your mouth. The pain from burning mouth syndrome may affect your tongue, gums, lips, inside of your cheeks, roof of your mouth, or widespread areas of your whole mouth. The pain can be severe as if you scalded your mouth.”-MayoClinic.com.